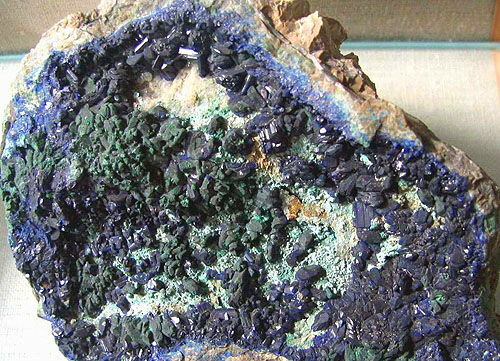 Azurite from the chemical point of view similar with malachite and is the carbonate (by carbonate salt) of copper of Su3(S03) 2(0Н) 2. The dark blue colouring of stone is conditioned exactly connections of copper. The picture of stone very looks like malachite. The name of stone ascends to the Persian word of lazard (blue). The crystals of Azurite meet in copper-ore districts in the USA, in Russia on Altai and on Ural, in Kazakhstan, Germany, Africa (Zaire) and Australia. Malachite and Azurite often be near with each other and at times form accretions - so-called azuremalachite (chrysocolla), from which do jeweller decorations. In the European painting from XV century to the middle XVII century on the basis of Azurite made a dark blue paint for the mural painting which was used more widely, than paint on the basis of Lazurite, lapis lazuli. It is related to that Azurite gives an excellent dark blue color, but here does not require such large as dear Lazurite, lapis lazuli of expenses of time and money on enriching of paint. For an artist Azurite, as well as Lazurite, lapis lazuli, is a dark blue celestial pigment of paints, incomparably more accessible, but very flimsy. A paint lives by the special life - blue Italian skies green on century-old pictures - oxidize! Dark blue Azurite straight on linen of artist passes to green malachite. 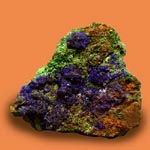 In Ancient Egypt Azurite served for the increase of force of consciousness. 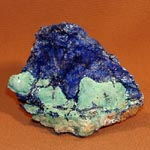 In our days many Medical stone lithotherapeutics add Azurite curious properties. 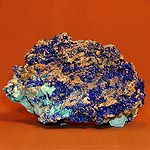 Azurite carries curative energy and able to render the positive affecting all of levels of our life - from physical to most thin. Azurite helps to contest with a melancholy. 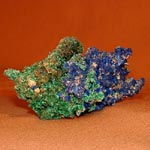 Wares from Azurite will help control with the burst of anger, overcome emotional excitation, fear and stress.